Adafruit Learning System News: Updated Guides Notification « Adafruit Industries – Makers, hackers, artists, designers and engineers! We just deployed a small, but important, update to the Adafruit Learning System. We now bring attention to any guides that have been recently updated by displaying a red ‘UPDATED’ ribbon. Check out the example below. Whenever a guide has been modified to update outdated information or whenever a guide has information or pages added to it, we will let you know right on the homepage. More updates coming soon! 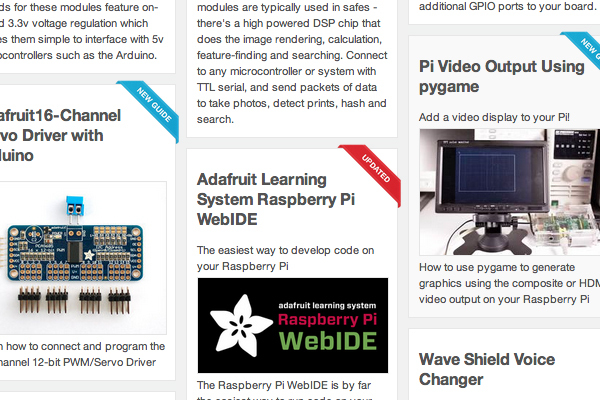 Check out the Adafruit Learning System at http://learn.adafruit.com.